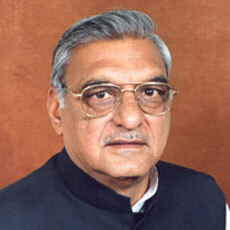 28 Oct : Newly elected Haryana’s Chief Minister Bhupinder Singh Hooda will seek a vote of confidence to prove his majority on the floor of the House in a crucial one-day special session of the Haryana Assembly is to be held in Chandigarh on Wednesday . Chief Minister Hooda will seek a vote of confidence when the state Assembly meets for the first time after constitution of the House. Governor Jagannath Pahadia had given time to Hooda to prove his majority on the floor of the House by 31st October as Congress fell short of majority by six seats and staked claim with the support of seven Independents. Pahadia will also make his customary address on the opening day after the newly elected MLAs are administered oath by pro-tem Speaker Ajay Yadav. The House will take up for discussion the Governor’s address followed by voting on the motion of thanks to his address, an official spokesman said. In the 90-member House, Congress has 40 MLAs, INLD 31, HJC (BL) 6, BJP 4 and others 9.